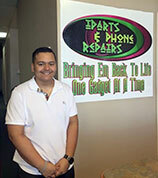 A 2012 graduate of Bella Vista High School and founder of iParts and Phone Repairs, Alika sold his first product for profit when he was five years old. Always having an entrepreneurial outlook and coming from a family with a background in electronics that strongly believes in free enterprise, Alika founded his first business iPhoneReplacementParts.com when he was 13 years old selling iPhone parts online and accepting iPhones in for repair from all over the world to his house. He opened his first store in Citrus Heights in 2009 when he was 14 and a sophomore at BVHS. His Mom, Dad, and sister Kala ran the store for him while he was attending school. Alika would come in to work after school and on the weekends. As each new product like androids and tablets were introduced into the industry he learned how to repair them and offer the service to his clients. He then began incorporating things like unlocking devices and selling cell service like Simple Mobile and h20. As his business grew and the world started going the way of devices he started needing more technicians. He started hiring and teaching his friends that he had gone to school with all of his life. Once he graduated high school he started running the business himself. He took certification courses to broaden his level of repair and then sent his employees to get certified so they could learn too. In 2010 he started selling and marketing corporate accounts to his clients who were from businesses or large outfits when they walked through his door. In 2013 he added his sales and marketing director to promote his business in the field and sell corporate accounts and establish relationships with power partners such as box stores and carriers. Alika opened his Vacaville location in February 2014. Current project…opening a new store. Future project…he’ll be one of the first ones to figure out what that next new wave is and he’ll ride it!